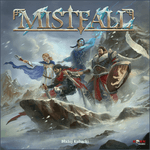 Includes Mistfall heart of the mists standalone game/expansion which means tons more content. Also includes Sand and snow expansion and Valskyrr expansion. All in very good condition but all in one box.